One Eternal Day: What is Communion for? Before engaging with the sacraments, I thought about grace almost exclusively in terms of the forgiveness of sins. The accompanying images were of removal: “Purge me with hyssop, and I shall be clean; wash me, and I shall be whiter than snow.” ...[A]n exclusive focus on grace as forgiveness implies that except for our assorted wrongdoings, we are basically whole and healthy. On the one hand, I understood that was inaccurate: the phrase “spiritual growth” was in my religious vocabulary. But I lacked a vision for how grace operated not merely to cleanse but also to edify. Of course, the tradition I grew up in was not entirely without additive spiritual practices. The study of Scripture was commonly discussed in quasi-sacramental terms. .... We naturally understand that filling our heads with holy writ could tend to give us the mind of Christ. 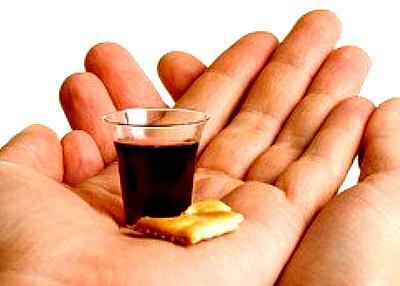 But that by filling our stomachs with bread and wine we partake in the divine life comes as something of a surprise. It reminds us of our need for God to act on us and for us, that grace is an intervention. It cures us of our native Pelagianism.